Nutrien - until now the biggest importer of phosphate rock from Western Sahara - has ended its trade. But what about the stock-exchange registered Sinofert Holdings in which they are the second biggest owner? Above: The bulk vessel Kiran Adriatic is set to arrive China on 22 February 2019. It is the third vessel to arrive China with phosphate rock during the last months. 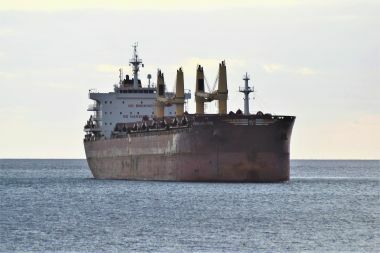 The picture was taken at Santa Cruz de Tenerife, Canary Islands, on 16 January 2019, when the ship was heading towards El Aaiún to load the controversial cargo. Click on photo for high resolution pop-up. From what Western Sahara Resource Watch (WSRW) understands, the Chinese stock-exchange registered company Sinofert Holdings is now, for the first time, involved in the trade of phosphate rock from Western Sahara. Sinofert is 22% owned by Nutrien Ltd, and 52,7 percent controlled by the Chinese government-owned Sinochem group. WSRW on 19 January sent a letter to Sinofert and to its second biggest owner Nutrien, to enquire whether our information about Sinofert's participation in the controversial trade is correct. Neither Sinofert nor Nutrien responded to WSRW's request. The probable imports to Sinofert Holdings - the first ever - took place on 28 November 2018, as the bulk vessel Trade Resource (IMO 9693410) arrived the port of Lianyungang, China. The vessel had picked up approximately 79000 tonnes of phosphate rock from occupied Western Sahara on 19 October 2018. Trade Resource is the third biggest vessel ever recorded to have transported phosphate rock from the territory since WSRW started daily monitoring of the traffic. It does not happen often that new companies engage in such trade with conflict minerals from Western Sahara, a trade which is instrumental in paying for Morocco's costly occupation of the territory. Since WSRW started its monitoring of the trade in 2011, thirteen enterprises have ended its purchases from Western Sahara, while only four new importers have emerged: Agrium from Canada (which merged into Nutrien, and ended its imports into North America on 31 Dec 2018), Paradip from India (part-owned by OCP, started imports in 2016 and still continues to do so), Coromandel (which has taken in one single shipment in January 2019) and now Sinofert Holdings. From 2013 until end of 2018, Nutrien took in approximately 50% of all phosphate rock illegally mined in the territory. Obviously, the Moroccan government's state-owned phosphate firm OCP has been keen to replace the disappearing market. 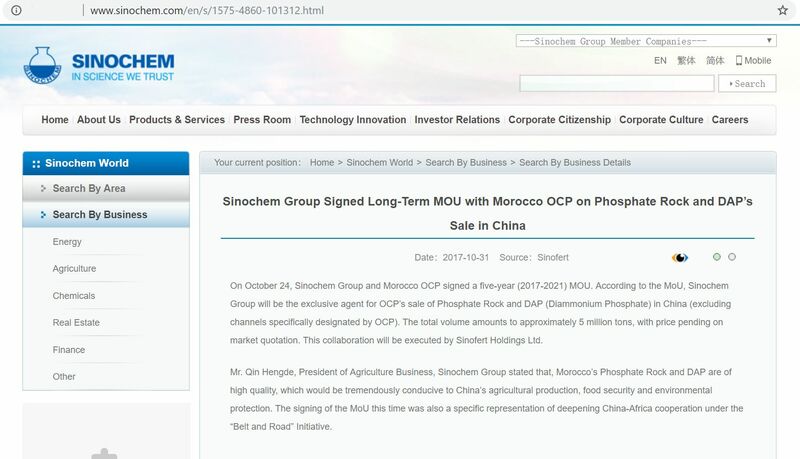 Sinofert Holdings' largest owner, Sinochem, announced on its website on 31 October 2017 that OCP and Sinochem had entered into a 5 year (2017-2021) contract for supplies of phosphate rock, to be executed by Sinofert Holdings Ltd [or download] . The statement did not specify from which mine(s) the rock would be sourced. From what WSRW has been able to gather, the cargo onboard the Trade Resources was purchased by Sinofert. On 20 January 2019, the vessel Kiran Adriatic (IMO 9653185) departed El Aaiún, Western Sahara. The last known location was registered on 24 January at mid-Atlantic, steaming in south-west direction toward Brazil, but with "China" as registered country of arrival. WSRW does not know of other cases where vessels headed to Asia have taken a route westward across the Pacific Ocean. 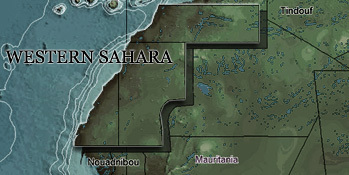 WSRW knows of no other Chinese importers ever having purchased rock from Western Sahara, and thus consider it probable that Sinofert is the recipient. The picture to the right was taken on Canary Islands three days before it docked at El Aaiun port. On 13 November the vessel Amoy Action (IMO 9583627) departed the port of Paradip, India, heading through the strait of Singapore, to "Sinofert's" port city of Lyanyungang. As it had come to Paradip on 6 November it was transporting phosphate rock from the territory. The draught changed from 13 meters upon arrival Paradip, to 13,2 meters upon departing - in other words, the cargo was heavier when it left Paradip than one week earlier when it had arrived with rock from the Bou Craa mine. Logically speaking, Amoy Action's cargo could have consisted of a partial cargo of unprocessed rock from rock from Western Sahara that were never offloaded, or of phosphate derivatives (perhaps originating from Paradip's earlier Western Sahara imports) processed in Paradip for use by Sinofert and loaded onto the ship in Paradip port. It is worth noticing that the importing company PPL in Paradip is majority owned by the Moroccan exporter in Western Sahara, OCP. In January 2019, a vessel bound for the same OCP-owned PPL in India stopped over in the port of Visakhapatnam where it dropped off a part of its cargo in the way for a new company in the trade, Coromandel International. The corporate relationship between Sinofert and Nutrien is described in the latest Nutrien annual report. Nutrien labels Sinofert as the "company’s most significant investment accounted for as FVTOCI". Sinofert Holdings is 2,44% owned by the Norwegian government pension fund. The fund, which is the third biggest investor in Sinofert, owns 28 million USD worth of shares. The Norwegian government pension fund has systematically excluded companies involved with long-term supply contracts from the Bou Craa mine since it considers the trade to constitute a "particular serious violation of ethical norms". The Vanguard Group, Dimensional Fund Advisors LP, BlackRock Fund Advisors, Macquarie Investment Management Business Trust own each between 0,4 and 0,86 percent of the Sinofert shares each, according to Marketscreener. There are today only five clients of phosphate rock from the occupied territory: Paradip (India), Coromandel (India), Sinofert (China), Ballance Agri-Nutrients (New Zealand) and Ravensdown (New Zealand).